‘Making Our Mark’ is initiated by the Romantic tradition of walking for pleasure, rather than for necessity, where nature was seen as an ideal, and walking in the landscape was a means to stimulate the imagination. Viewed in this sense, it is both a visual and contemplative experience, rather than just a physical one, where the rhythm of walking generates the thought process. The poet William Wordsworth was the founder of walking for pleasure, seeking solitude in the English countryside and recounting his numerous walks in poems such as ‘The Prelude’, which established a new literary tradition. This Romantic desire to discover unchartered territory is still relevant today, demonstrated by our inherent longing for escapism from claustrophobic urban environments to remote natural spaces. Drawing inspiration from Romantic poet's such as Coleridge and Wordsworth, Waterman has documented her own rural walks on the Isle of Wight over the course of a year. Photographing the footprints she encountered along the way, as well as her own wandering footsteps, she has discovered new places, as well as retracing familiar routes. Having identified these visual clues left behind from previous journeys, the artist has translated them into visual narratives that consider the way in which we leave our impression on the landscape through signs of passing or presence. 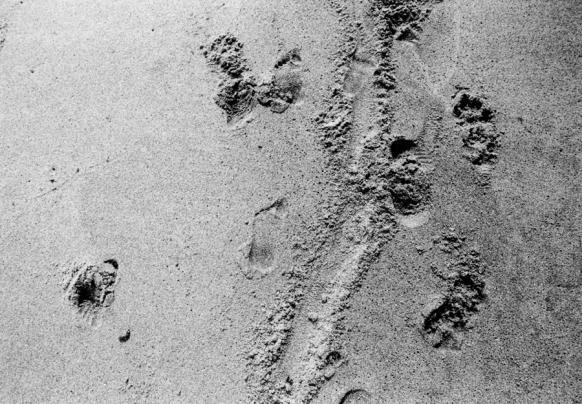 The narrative sequence of thirty ‘footprint’ photographs, which represents the age of the artist at the time of production, serve as a visual reminder, or ‘memento’ from each excursion are displayed as a meandering walk that the viewer is encouraged to follow. This not only simulates the process of the walk itself, but functions in the same way as a story that gradually unfolds over time. The accompanying edited quotations from Romantic poetry that illuminate the work’s central themes are handwritten in pencil directly onto the gallery wall, which together with the chosen method of installation, allude to the temporal nature of the actual footprint itself.